Polish Military Institute of Armament Technology (WITU – Wojskowy Instytut Techniczny Uzbrojenia) developed the RGO-88 which replaced the obsolete F-1. 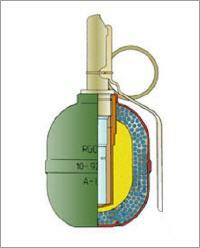 The grenade is being produced by “DEZAMET” S.A. Metalworks in Nowa Dęba and consists of a case in two parts (made of steel sheet), a fragmentation sleeve (1150 steel balls of weight 0,25 g each, in plastic filler), high explosive filling (RDX) and a plastic fuze housing. Fuze : UZRGM or URGZ.